Having grown up on the west coast of Sweden I've been to Denmark more times than I care to think of. Two of the things I will always associate with Denmark is their pølsevogn and their rød pølse. In the socialist state of Sweden we weren't allowed to import the røde pølser - they were deemed too bad for you due to the lovely added colouring. Since it was quite some time ago that I had a Fransk Hotdog I checked with my tame Dane as to what sauces she would expect to be able to choose from in a proper pølsevogn. Apparently this stirred some good memories and I was swiftly called some names for making her crave a Fransk Hotdog. Between my hazy memories and her being a Dane by birth we quickly established that actually - the selection would roughly be what you'd expect to be able to choose from at your local kebab van here in the UK. Chili sauce, garlic sauce, mayo-ish sauce etc. This is another quick and easy meal(?) which is more of assembly instructions than proper cooking. But hey - sometimes that is what you need. This works ok for a picnic or why not for a kids birthday party? Either that or just admit that some days a good Frankfurter in some bread is just what you want. Bring a pot of water to the boil, remove from the heat. Pop the Frankfurters into the water and let them steep until they are nice and warm all the way through. Remove the Frankfurters from the water and dry them with some paper towel. Poke a hole in the bread, the handle of a wooden spoon works for this, that is wide and deep enough to fit a Frankfurter. 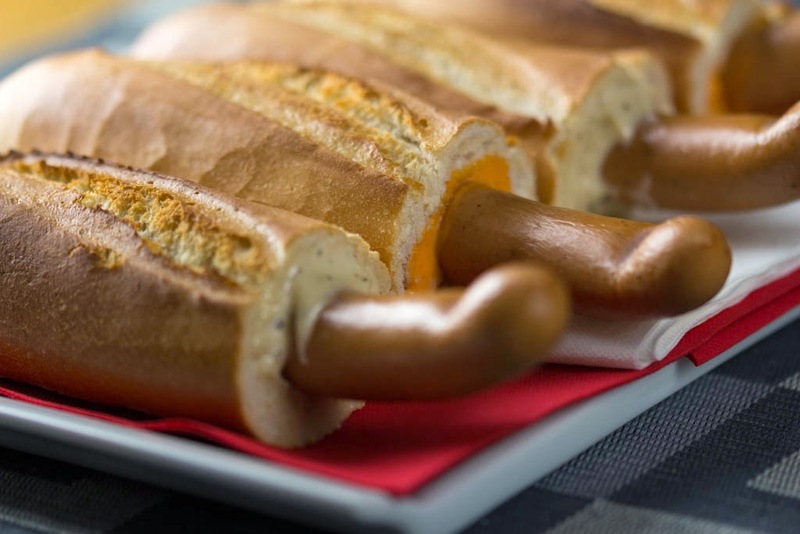 Add sauce to the freshly poked hole and firmly seat the Frankfurter into the baguette. 'Lesser Swedes' ? 'Been to Denmark more times than you care to think about' ? 'Tame Dane' ? I should probably be offended, but in between snorting with laughter, the subsequent asthma attack and swearing in Danish, I decided to feel proud. Yes, please share knowledge of this overlooked and very tasty hotdog ! I am now drooling !... Again.... Btw, I fully agree with your assessment of Unearthed. They are the only sausages I buy for hotdogs and brunches. Perfect ! Hopefully this post will get some people to try these beauts!